When it comes to choosing any type of outdoor equipment for the lawn or garden care, Black and Decker is a manufacturer that stands out. Producing performant and reliable tools, Black and Decker doesn’t really need a presentation. That is because most of the customers know that when they are getting a Black and Decker tool, they are getting top quality products made to last. And the things are not different when it comes to the weed eaters. Producing a wide range of electric weed eaters, this manufacturer addresses all the lawn owners or lawn care professionals who want to buy a reliable and effective tool. I can only recommend all Black and Decker tools. However, there are a few weed eaters that simply impressed me with their performances. I’m going to talk about them in the following Black And Decker Weed Eater Whacker reviews. But first, let’s see how to pick a Black and Decker weed eater. How To Choose A Black and Decker Weed Eater? How To Change The String Of A Black And Decker Whacker? Black and Decker manufactures a line of weed eaters that are dedicated mainly to the residential users, but some lawn care professionals also find their tools to be extremely effective. However, regardless the type of user you are, there are a few guidelines to follow when choosing the right whacker. A weed eater is a tool that you have to carry around, so one of the most important things to consider when picking the right weed eater is the weight of the tool. As a rule, the weed eater should be as lightweight as possible, but you should also consider what type of tool you want before deciding the weight factor. Black and Decker produces both corded and cordless models of weed eaters. The corded models are definitely lighter than their battery-powered counterparts, but the power cord will limit your freedom of movement. On the other hand, the battery will limit your autonomy, but you will be able to work on any lawn, even if there is no power outlet nearby. Depending on your personal circumstances, you should choose the model that is more suitable for you. Personally, I prefer the cordless models even if they have are a bit heavier. Another important detail you should pay attention to is the possibility to adjust the length of the shaft. You will have to adopt a healthy position while trimming the grass or you will end up with back pain and other associated illnesses. Lastly, you should consider the versatility of the weed eater. The simplest models are cheaper, but you will only be able to trim the grass. If you want to avoid investing in other gardening tools, you should choose a model that can be transformed into a series of other tools, such as an edger, pruner, or cultivator. Fortunately, Black and Decker makes some exceptionally versatile weed eaters. Regardless the model you choose, if you want to be able to trim your lawn fast and efficiently, you should choose a weed whacker that has high amps for the corded models or high voltage for the battery-powered ones. The power will not only let you finish trimming faster but will also make the tool more effective on thick types of grass and weed. Depending on the size of your lawn, you should choose a whacker with a wider or a narrower cutting head. While some manufacturers make string trimmers with adjustable cutting swaths, unfortunately, this is not the case of the Black and Decker. Therefore, pay attention when choosing the cutting width. Another thing to pay attention to is the ease of using the string, like the auto-feed feature and easy recharging of the spool. If you want to find out how to change the string of a Black and Decker whacker, follow the guide below. When you run out of string on your Black and Decker whacker, you basically have two simple options: replace the cutting head with a new, pre-strung one, or replace the string in the old head by yourself. If you choose the second option, you will need a new trimmer line of the type specified in the tool’s operating manual. Using a different type of line might damage the whacker. Remove the battery or unplug the whacker and turn it over. To make this operation easier, you could sit on a chair or bench and hold the shaft with your legs for more stability. Remove the cap of the whacker’s head, then remove the empty spool, pulling off all the old string. Insert an end of the new string into one of the two holes present on the spool, then simply wind the string in the direction indicated on the spool. When the spool is full, cut the string and hook the end into one of the two notches present on the spool’s rim. Put the spool back into the trimmer’s head and feed the free end into the side of the head. Make sure to set the spool properly back into its place.Put the cap back on the trimmer’s head and lock it in place. If you need more explanations on how to replace the string of a Black and Decker whacker, watch the following video. One of the most popular whackers from Black and Decker is the LST522. Boasting a 20-volt battery and weighing less than six pounds, this weed eater boasts a long autonomy and can be handled with ease. The whacker is part of the convenient 20V MAX system, that basically allows all the tools from the system to share the batteries, a convenient solution if you own more than one tool. The LST522 also features a power drive transmission system designed to increase the torque. This increases the overall power of the weed eater, while the two available speeds will allow you to choose between extended autonomy or more power. Multi-use tool: this weed eater can easily be transformed into a wheeled edger, giving you more versatility. Auto-feed spool: with this feature, the tool is easy to operate. Easy to handle: the LST522 is lightweight and has a telescopic handle that can be adjusted to the most comfortable height. 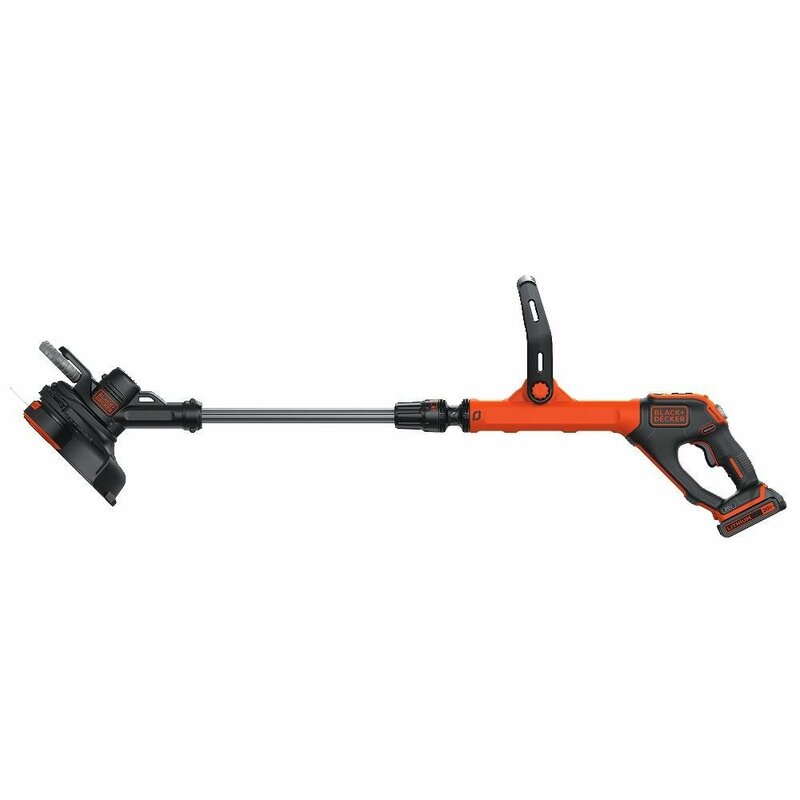 12-inch cutting width: perfect for small to medium size gardens, this weed eater has a 12-inch cutting width. Even if the battery is advertised as having a long runtime, some users believe that it drains out pretty fast. Maybe you should purchase a second battery too. Black and Decker designed this whacker to be efficient and convenient. The LST136W boasts a 13-inch cutting head and a 40-volt battery that provides not only more power but also a longer autonomy. The exclusive PowerDrive transmission will even allow you to trim the grass in areas that are difficult to reach, or you can use the tool as an edger to perfectly manicure your lawn. The 40-volt MAX batteries are interchangeable between the tools in the system, so if the battery drains out while trimming, you can replace it with a full battery from another tool. Power command dial: this weed eater has a convenient power command dial from where you can adjust the speed in the desired way. Automatic Feed Spool: you will not have to worry about bumping thanks to this great feature. Lightweight: this whacker weighs about 8 pounds, being easy to handle. Fast recharger: the tool comes with a fast recharger that fully recharges the battery in about one hour. There are a few complaints about the battery’s lifespan and autonomy. Another tool from the 20V Max system, the LSTE525 is another reliable whacker from Black and Decker. Similar in many ways to the LST522, this whacker also boasts a 12-inch cutting swath, the Power Drive transmission system, and the automatic feed spool. What makes this tool different is the presence of two 1.5Ah batteries instead of one 2.5Ah battery. You will not only have more autonomy, but two batteries are more versatile since you will be able to use one while the other recharges. Comfortable handle: in addition to a telescopic shaft, the LSTE525 also has a premium micro texture grip designed to increase the comfort during use. Extremely lightweight: weighing a little over 5 pounds, this is one of the most lightweight cordless whackers available on the market. Power command: with this innovative buttons, you will be able to automatically feed the line without having to stop the tool, flip from trimmer to edger and adjust the power. Two purchase options: you can choose to buy this trimmer with two 1.5Ah batteries (recommended) or with one 3.0Ah battery. Unfortunately, this whacker doesn’t come with a fast charger and one battery needs about four hours to charge. You can purchase a fast charger separately, though. Another valid option from the 20V Max series is the LST420. This whacker was designed to increase the performance, coming with two 2.0Ah batteries that provide up to one hour of autonomy for an uninterrupted use. To increase the user experience, this tool is lightweight, quiet and completely adjustable to be easy and comfortable to operate. The cutting width of 12-inch is ideal for medium size lawns. Runtime extension technology: you can choose between more power or longer runtime depending on your preferences. Smooth operation: thanks to the automatic feed spool, you will be able to operate the whacker without bumping. PowerDrive transmission: ensures a higher power to the string so you can efficiently trim any type of grass and weeds. Easy to convert: simply flip the trimmer to transform the tool into a powerful edger. Customers complained about the battery’s performances. My last selection is also part of the 20V Max series. What I like about the LST300 is the lightweight and versatility. Similar to the other Black and Decker weed eater whackers reviewed above, this tool is also equipped with a PowerDrive transmission and an automatic feed spool. This weed eater is quiet and easy to start in addition to being extremely easy to handle. As Black and Decker already accustomed us, this tool is also easily convertible from trimmer to edger with a simple flip. 12-inch cutting width: perfect for your small or medium size lawn, this weed eater has a 12-inch cutting width. Powerful: thanks to the PowerDrive transmission, this weed eater is more powerful compared to other weed eaters in its class. Pivoting handle: for an easier handling, this weed eater comes with a pivoting handle that is also adjustable in length. Compatible battery: you will be able to use the battery for any other tool from the V20 MAX family. Even if you will have the possibility to change the battery, the 2.0Ah battery included in the package will drain out pretty fast. That will be a problem if you don’t have another V20 MAX tool and you don’t want to invest in a secondary or more powerful battery. In my opinion, both details are extremely important if you want to be able to trim the grass or manicure your lawn fast and efficiently. Black and Decker could improve a little the performance of its batteries, but the great features and the convenient using of these tools make them some of the tops on the market.